WCHCTV Channel 3 (1021) celebrated five years of work on Wednesday at the Community Action Commission of Fayette County. Pictured (L to R): Angela Siler, Chief Fiscal Officer; Bambi Baughn, Community Action Executive director; Harry Wright, WCHCTV Channel 3 Executive Producer; David Woolever, WCHCTV Channel 3 Director/Station Manager; and Kathy Patterson, WCHCTV Channel 3 Producer and On-Screen Personality. WCHCTV Channel 3 (also available on channel 1021 on cable) celebrated five years of work this week, and the future is bright, according to officials at the station and at the Community Action Commission of Fayette County. The City of Washington Court House has owned Channel 3 — a local public access channel that has delivered information on various programs and events for the county — for many years. The station over this time was operated by a multitude of entities, including the city itself, Southern State Community College, Fayette County Memorial Hospital and others, but each time it was a temporary engagement. At the time Wright had not warmed up to the idea, calling the station a “White elephant,” and saying he did not want anything to do with it in the slightest. After several attempts by Winkle, Wright discussed the issue with his wife Mary (who has since passed away), who wanted to know why Wright didn’t want to be involved. Wright’s demands were simple, yet absolute, for him to work on WCHCTV Channel 3: He wanted to use the programming to make Fayette County a better place to live and educate kids, and he had the final say on all decisions for the station. Though he agreed, Wright still thought he would have been unable to work at the station due to a “No Compete Clause” with iHeartMedia he signed as part of his work at the WCHO radio station in town. At the radio station, Winkle had a meeting with Mike Smith and Dan Lathem to discuss this issue. Afterward it was decided that Wright would be allowed to work at the station, but the sounds from Buckeye Country would accompany the carousel. The carousel was the first thing Wright and Community Action wanted to get up and running, which happened about two months prior (in 2013) to the first locally-produced programming on Jan. 16, 2014. The next person to be brought into the fold was Kathy Patterson, producer and on-screen personality for the station. Patterson — who additionally works for the 97.5 FM WVNU radio station — was asked to be a part of the team after her many years working with Wright at WCHO radio. Wright and Patterson explained that while at WCHO, they grew the AM station listener base from around 980 listeners in 2012 to around 9,700 listeners, showing that these two just might be the best people for the task ahead. In the last five years WCHCTV Channel 3 has grown more quickly than most at the station could have imagined. Just in the short time — with fiscal support from the community, the city and organizations like Fayette County Travel & Tourism — Wright and Patterson increased the amount of locally produced content by an exponential amount, all the while still keeping the carousel and community news at its heart. 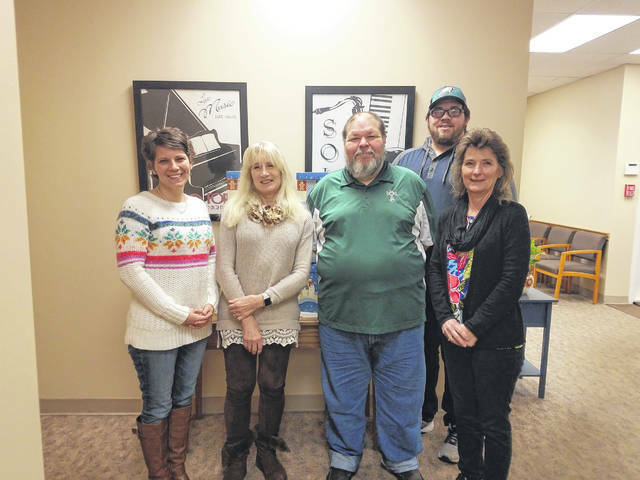 Over time the group has completed work on several local programs, including “Eating Out in Fayette County,” “Getting Fit in Fayette County,” “Shopping in Fayette County,” and more. The station has also dedicated time to covering the WCH city council meetings, and recently introduced live high school athletic events to the line-up, which are streamed immediately on Facebook at WCHCTV. So far basketball games, wrestling tournaments, and a “Coaches’ Corner” show have all been live-streamed on Facebook and replayed later on Channel 3 (1021) for the community to enjoy. All of this content has had thousands of viewers from all around the country and beyond, including Florida, North Carolina, and even one in Germany, and is planned to continue. A big contributor to the success of the station — according to Patterson, Wright and Baughn — is David Woolever, director/station manager of WCHCTV Channel 3. Woolever took over the position around three years ago this August, and said he got the job in a funny way. Woolever started toying with cinematography and video editing back in 2010. His wife, Mara, was actually in school for film editing and he would watch her from time to time. Eventually, Woolever picked it up and started doing it more regularly. Since then, he has started his own production studio (Other Side Studios) with Mara. For Woolever, one of his favorite parts of the job is being able to interact with community leaders and the general public. The feedback and support they have been getting has been amazing, and he said it’s very cool to know that the things he does mean something to the community. Woolever said he believes the future of channel 3 is a bright one. The team is consistently planning for new original programs and with the addition of local high school sports coverage live on their Facebook page, Channel 3 has already been able to reach new heights that not a lot of people thought it could in a relatively short period of time. All involved in the WCHCTV Channel 3 project are excited for the future and have similarly aligned goals to get there. One of the main objectives for both Wright and Baughn is making the station self-sufficient through sponsors and community members. Neither expect the station to become profitable, but just being able to pay full-time employees to man the station to “break even” would be a great start. Wright said the money would go to paying for his position, a permanent solution to pay for Woolever’s position, and much needed equipment for the station. He said he needs these positions to be paid — not for his sake as he had fully expected no money to come his way while working on this project — but for the people who take over after him. Also in the plans is a slew of new local programming, including more eateries and shopping, a local history series in conjunction with Paul LaRue and Bev Mullen, horse races at this year’s fair being live-broadcast, and more. That’s not all though as Wright, Woolever, Baughn and Patterson all said they hope to bring in local students who have an interest in television. They hope by doing this they can not only find volunteers who will gain real world experience in the field, but also help to increase an attitude of volunteerism in the community among the younger generation. As time marches on, the group said they hope to continue to help Fayette County with Channel 3. Whether that be with local news and coverage of community events or teaching the next generation about the television process and the importance of volunteering, WCHCTV Channel 3 will continue to move forward, ready for the next opportunity to grow even more. The information in this article was provided by Bambi Baughn, Harry Wright, Kathy Patterson and David Woolever. For more information contact WCHCTV Channel 3 (1021) at the Community Action Commission of Fayette County at (740) 335-7282 or visit them at 1400 U.S. 22 in Washington Court House. https://www.recordherald.com/wp-content/uploads/sites/27/2019/01/web1_20190116_133947.jpgWCHCTV Channel 3 (1021) celebrated five years of work on Wednesday at the Community Action Commission of Fayette County. Pictured (L to R): Angela Siler, Chief Fiscal Officer; Bambi Baughn, Community Action Executive director; Harry Wright, WCHCTV Channel 3 Executive Producer; David Woolever, WCHCTV Channel 3 Director/Station Manager; and Kathy Patterson, WCHCTV Channel 3 Producer and On-Screen Personality.